Inkling getting screen KOed in Super Smash Bros. Ultimate after recently getting inked by another Inkling. A Screen KO (手前やられ, Forefront defeat) is a special type of KO which has a chance of occurring when characters are launched past the upper blast line. In contrast to a Star KO, the character instead falls into the foreground and appears to crash into the television screen, before they are KOed at the bottom. Whether a character is Star KOed, Screen KOed, or merely blast KOed is mostly random. In the first three games, Screen KOs are considerably rarer than Star KOs; as a result, Screen KOs rarely involve two or more characters at once. In the fourth game, the frequency of Screen KOs has been increased, especially in the 3DS version, to be about as common as Star KOs. In Smash 64, characters yell out their Star KO scream and fall down between the front of the stage and the camera, getting KOed by the bottom blast line afterward. Depending on the camera angle, this may not always be visible. The distance the character is from the camera is chosen randomly — sometimes doomed characters appear to be falling normally, while at other times they are just a quick flash of color going down the screen. Screen KOs have the same duration as a Star KO. Unlike the other games of the series, Screen KOed characters do not actually hit the screen in any way. In Melee, all characters, with exception of Mr. Game & Watch, have a unique tumbling animation for when they crash into the screen; upon striking the camera, the character also yells out one of their strong knockback groans, then gets KOed by the bottom blast line without making any sounds. How close a character being KOed is to the camera is no longer determined by randomness, but by the stage being played on. On Mushroom Kingdom II, for example, Screen KOed characters are very close to the camera and thus appear much larger. With the introduction of Coin Battles, Screen KOed characters also visibly drop numerous coins when they hit the screen. While Screen KOs in Smash 64 were roughly the same length as star KOs, Screen KOs in Melee are significantly faster than Star KOs. This difference is significant, and can potentially affect gameplay. For example, when a character is KOed by Jigglypuff's Rest, getting a Star KO means that the character will not respawn fast enough to punish the sleeping Jigglypuff, due to the length of the Star KO animation. However, if a character is instead Screen KOed, this provides them with more time to potentially get a solid hit on the vulnerable Jigglypuff. The Screen KO's shorter duration can also influence the outcome of matches that have gone to a last stock situation. If both characters are KOed off of the top at around the same time and one is Screen KOed instead of Star KOed, the Star KOed player will win the match due to random chance and the lengthier animation. There is a bonus for getting Screen KOed, Foresight, which grants the receiver 500 points for every time they are KOed this way. Flat Zone features a different animation for Screen KOs compared to other stages, where characters hit the screen in their tumbling animation instead of their standard screen KO animation. In Brawl, with the exception of Meta Knight, King Dedede, Mr. Game & Watch, and Sonic, characters use a side version of their regular tumbling animations for a Screen KO, though the animations for the actual impact are not as nuanced as in Melee. Like Melee, Screen KOs are considerably faster than Star KOs, again potentially leading to some gameplay effects. With the removal of strong knockback yells in Brawl, characters now either use their regular pain yells or say nothing at all when they hit the screen. In SSB4, instead of using their tumbling animation, every character now uses a unique Screen KO animation depicting them flying towards the screen, hitting it face-first, then staying in place briefly before sliding down. Due to this new separate animation, several characters pose during their Screen KOs in a manner referencing their series, such as Kirby reusing a pose from Kirby Triple Deluxe, Cloud using a pose similar to his official render, and Shulk hitting the screen with his back in order for his Monado Arts to be visible. Characters who share the same base model tend to share the same Screen KO poses, such as Ness and Lucas. While Smash 4 re-added strong knockback yells that were absent in Brawl, Screen KOed characters in SSB4 no longer make any vocal sounds when they hit the screen, and instead, a comical "thud" sound effect is played. As a direct result of the new Screen KO's "pause", Screen KOs and Star KOs take almost equally as long to resolve, not affecting gameplay as much compared to Melee or Brawl. Furthermore, Screen KOs and Star KOs are both disabled during the final five seconds of a match and Sudden Death — characters will simply create the usual colorful blast after crossing the blast line. Blast KOs can still occur even if the match has no time limit or if it is in an early part of a timed match. Several characters have different Screen KOs between both versions. The maximum amount of characters that can be Screen KOed at one time is three. In Super Smash Bros. for Wii U, Screen KOs are disabled on Super Mario Maker, Jungle Hijinxs, Flat Zone X, Duck Hunt, Wii Fit Studio, Pac-Land, and Umbra Clock Tower, and players instead are either Blast KOed or Star KOed on these stages. Screen KOs are available in all stages except Super Mario Maker and Umbra Clock Tower in Super Smash Bros. for Nintendo 3DS. Screen KOs appear to be similar to Smash 4 visually. They once again complete faster than Star KOs, which will affect gameplay and can now happen even at very high knockback speeds. For the first time in the series, certain attacks can cause instant Screen KOs, such as Giga Bowser Punch. Additionally, at the end of the animation, the colored blast from a Blast KO appears. In early gameplay videos of Brawl, characters would sometimes hit the upper blast line with the standard colorful blast generally seen only by certain single-player mode enemies; this characteristic would later return for Super Smash Bros. 4. 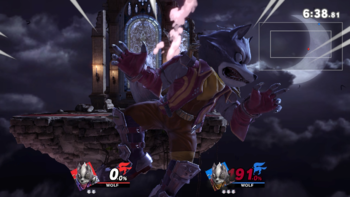 In both Melee and Brawl, it is possible to see a character about to hit the screen right before they are KO'd by pausing and then zooming out. This can be seen particularly on larger stages such as New Pork City and 75m. This is also possible in Ultimate, albeit zooming out makes the character disappear. Similarly in Smash Wii U, it's possible to see the white lines just when a character impacts the screen when pausing (though the character can't actually be seen). Unlike the trivia point above, this can be seen even on small stages. In SSB4, when a character gets Screen KO'd, all of the remaining fighters' player indicator icons disappear until the character that is being Screen KOed is actually KOed (when the numbers on the damage meter break). This also includes CPU and amiibo fighters. The camera will also shift to a random position. In SSB4, Pit and Dark Pit have two subtle Screen KO differences, depending on how their bows were last used: one with them holding their bow in their right hands, and the other with them holding the two separated parts of their bows as blades. In the Wii U version of SSB4, Mario, Kirby, Pikachu, and Dr. Mario use unique models during their Screen KO, since their bodies are pressed flat as if hitting a glass pane; however, Mario and his clone Dr. Mario only have a model for their heads, while Kirby and Pikachu have their bodies. In SSB4, Bowser and Donkey Kong are the only characters to fall back when Screen KO'd, as all the other characters just slide off the screen. Ultimate later adds King K. Rool. In the 3DS version of SSB4, Screen KOs may cause the two images simulating the screen's 3D effect to be misaligned. This often occurs when multiple opponents are Screen KOed, or if there are too many effects occurring in the background. As of update 1.0.8, Screen KOs will never occur in SSB4's training mode. Lucina is the only Echo Fighter in Ultimate to have a different Screen KO animation than the character they are based on, but a few other echo fighters like Daisy and Chrom have different facial expressions. Inkling is the only character to have different Screen KO animations depending on which alternate costume the player selected. Yoshi gets Screen KOed on Kongo Jungle. Samus hits the screen in her tumbling animation—this Screen KO animation is specific to Flat Zone in Melee. Ganondorf about to hit the screen in Yoshi's Story. Ness being Screen KOed on Shadow Moses Island. Luigi getting Screen KOed in Super Smash Bros. for Nintendo 3DS. Shulk and Marth getting Screen KOed, showing the player indicator icons disappearing during the animation. Roy getting Screen KOed while Shulk gets Star KOed, showing the length of both KOs being about the same. In comparison, Falco getting a regular KO through the upper blast line is more immediate, and he respawns while the other two are still in their KO animation. Mario and Little Mac getting Screen KOed in Super Smash Bros. for Wii U.
Giga Bowser instantly Screen KOs Olimar and Pit in Ultimate. This page was last edited on February 17, 2019, at 11:00.